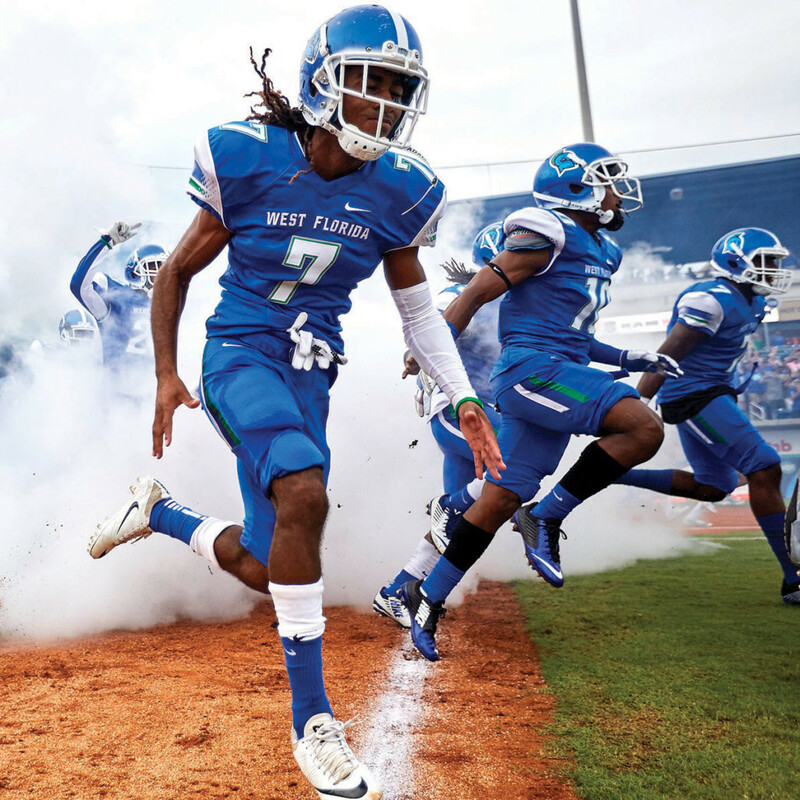 University of West Florida President Martha Saunders always figured the university’s new football program was a hit on campus. But she’s been blown away by the interest in Argonauts football shown by the community. With scores of tailgaters celebrating throughout the inaugural 2016 season, UWF sold out their first football games at Blue Wahoos Stadium in downtown Pensacola, drawing more than 31,000 fans to the venue over five home dates — an average attendance of 6,300. UWF Athletic Director Dave Scott says that kind of growing popularity serves as a powerful marketing tool. That means the program has the potential to increase enrollment across the board. Saunders says the new football program has added a “wonderful zest” to UWF’s campus life, offering that social experience so many students seek during their college years. Although the Argos lost their final three games of the inaugural 2016 season, the team placed sixth in the Gulf South Conference (GSC) after a pre-season coaches’ poll had put them at eighth place. By all accounts, fans can expect that same effort and commitment in the 2017 season, which opens Sept. 2 in Rolla, Missouri, when UWF takes on the Missouri University of Science and Technology. This fall, fans can also look forward to more home games, afternoon and evening start times and a roster of players eager to apply some hard-won lessons. In fact, Shinnick says the Argos will take the field as a wiser team with greater knowledge of their opponents. Since last season, Shinnick has hired a new defensive coordinator, Darian Dulin, and added former quarterback Kaleb Nobles as an assistant coach.